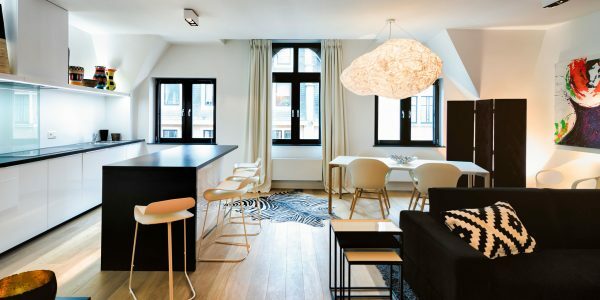 Elegant 100m² apartment with two bedrooms, two bathrooms and a quiet balcony – located in the heart of Brussels’ historic area of Ilôt Sacré – opens on to large living/dining area with fully-equipped kitchen. Accessed by an elegant Art Deco black and white color scheme staircase with elevator, the flat can host up to 6 people. Bathed in natural light, the living area is distinguished by its fine modern decoration with colourful vases and charming wood stools – which brings out a cosy atmosphere that makes you feel at home. With its wooden parquet floors, soft rugs, large convertible sofa and a charming fireplace, enjoy a relaxing evening in the lounge area on while watching a film among many international channels. Fully-outfitted modern kitchen equipped with a dishwasher, washing machine and spin-dryer. With its multiple cupboards for storage, there is plenty of counter space to work. The main bedroom has a comfortable atmosphere with its refined nautical decor – and is furnished with a queen sized bed, cabled flat screen TV / large bathtub / separate toilets and balcony. The apartment also includes an extra bathroom vanities with an Italian shower and toilets. The saw-tooth roof of this entirely covered red brick facade instantly immerge visitors in Brussels’ history and atmosphere. Fantastic central location in a quiet side street, with only a stone throw away from The Grand-Place, Manneken Pis and right next to the Queen’s Gallery. The Ilôt Sacré is famed for its fabulous fusion of culture and architecture. 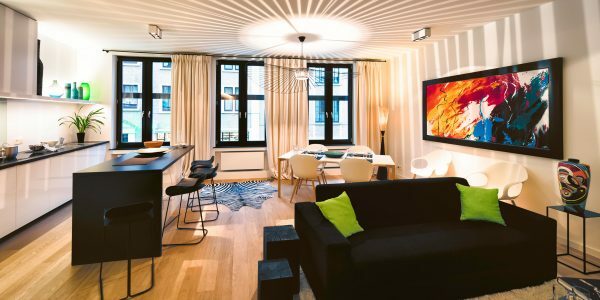 Only a few steps from the Central Station, the building is easily accessible by public transportation – with direct links to the airport, shopping areas and all Brussels districts. 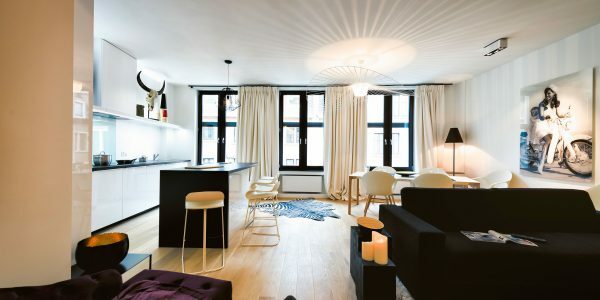 The building Montage gives you access to European capital’s most emblematic sights while making yourself at Charles’ Home. Nice Contemporary Styling Apartment with Two bedrooms – located in the heart of Brussels’ historic area Nice contemporary styling 100m² ..
Modern Two-Bedroom Apartment – located in the heart of Brussels’ historic area Modern 100m² apartment with two bedrooms, two bathrooms .. Spacious Two-Bedroom Apartment – located in the heart of Brussels The apartment benefits from an excellent natural light and has ..